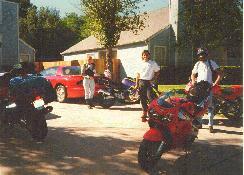 I have been motorcycling for 20 years. Currently, I own a Suzuki Bandit, which I bought in September of 1995. You can read a review of the Bandit courtesy of the reviewers at Motorcycle Online. My inspiration is my father who has been riding motorcycles since the 1940's. He owns three motorcycles, of which his favorite is a Kawasaki 900. 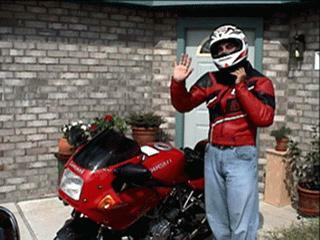 During my college years when I did not own a motorcycle, I gladly rode his. Often, we rode together in the Watchung mountains of New Jersey. Click on the image to view GIF movie (214 kB). This page contains road trips in Hill Country and the areas around Austin and San Antonio, Texas. 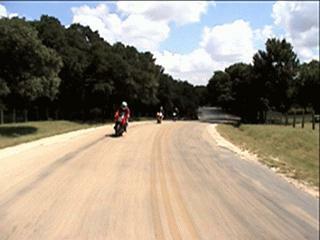 The roads have been extensively travelled and tested by our crew. Hours of painstaking research and gallons of gasoline have been poured into this difficult research. 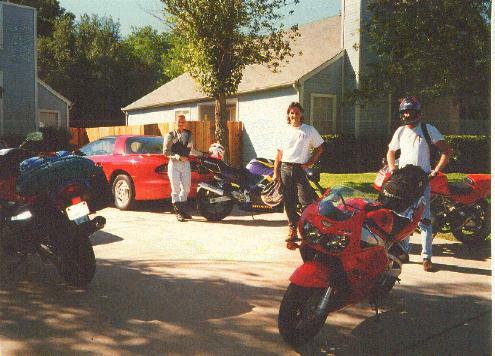 Read all about a motorcycle journey from Austin, Texas to Las Vegas, Nevada, 22 June 1996 to 30 June 1996. Read all about my roommate Brien's red screaming joy toy. Click on Miguel to say Hi (153 kB). Last modified: Thursday, 09-Jun-2011 13:01:04 MST. Page hits: [an error occurred while processing this directive].